Announcing the new In Color Club 2018-2020... crafting on a budget! Ever get that feeling that you really want to craft but just don't have the funds available to get it all? Well, here's a solution for you.... The Crafty Spark In Color Club 2018-2020! So how does the In Color Club 2018-2020 work? Well it's very simple.... you pay a set amount each month for five months and in return you receive lots of Stampin' Up! goodies in that month's colour! You can join any day of any month, there's no restriction - no waiting for one club to finish and the next to start! 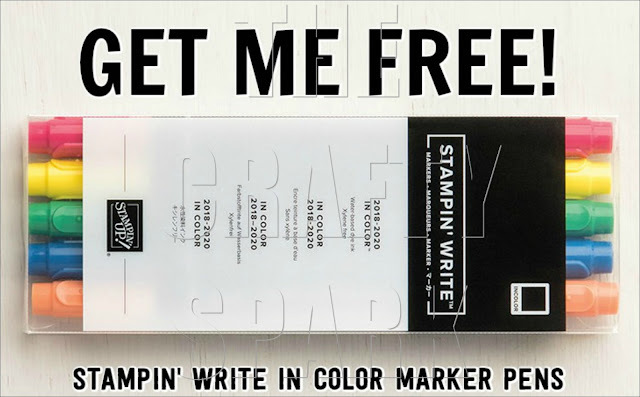 Plus as an added bonus, in your last month you receive a FREE SET OF IN COLOR STAMPIN' WRITE! MARKERS!